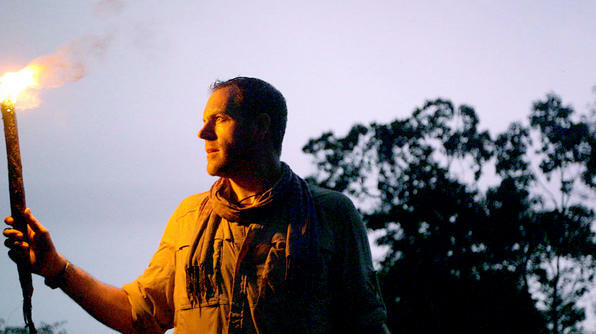 Being a real-life Indiana Jones, Josh Gates gets to travel the world and attempt to solve different mysteries and explore the unexplained in Expedition Unknown. This new television series premiered on the Travel Channel last week. Fans may recognize Gates from his appearances on different programs within the Syfy Family, including various episodes of Ghost Hunters, Stranded and Destination Truth. In fact, despite airing on a different network and being a totally separate program, Unknown feels like an extension of Truth, but more grounded in reality. While in Destination Truth, Gates searched for proof of urban legends and paranormal activity, Expedition Unknown feels similar, but based in fact. The series premiere episode featured Gates hunting for the remains of Amelia Earhart in Papua New Guinea, which was the last confirmed location for the pilot. He explored new evidence of aircraft rubble found near the island, as well as newly discovered human bones, found by Gates, that might just be from Earhart. The bones are currently being examined by the local authorities. In the second episode, Josh Gates puts his Archaeology degree to good use. Hoping to find a real-life Temple of Doom, Gates travels to Cambodia to explore the lost city of Khmer Empire, which is currently being excavated from an overgrown jungle. Dangers lurk everywhere, from snakes, scorpions and even landmines, which populate this nation. Using current technology, archaeologists hope to uncover a mystical relic within the city, before looters beat them to it. solo act for Gates, while Truth was more of an ensemble piece, which he shared with his production crew. As an explorer and adventurer, Gates truly enjoys his road trips in a search for knowledge. While he does have better modes of transportation in this series (his vehicles always suffered an unfortunate fate in Truth), I do question his wardrobe choices (such as wearing a scarf while venturing through the sweltering, tropical jungle). One big problem of the show: I don’t like the irregularly sized subtitles, which are hard to read at times. Oftentimes, I’ll have to rewind the show to re-read whatever a foreign person said, just to be up-to-date with the program. Upcoming episodes feature Russia’s missing Amber Room, Jesse James’ missing gold and Captain Morgan’s hidden treasure in Panama. We’ve had past interviews with Josh and even though we were sad that Destination Truth ended after five seasons, we’re super excited to see where Destination Unknown takes him. Although, with no Twitter, Facebook or even a series-based Website, what kind of social-media support is Travel Channel offering to this brand-new TV series? We only hope it’s not short lived. Strength: Gates is a fun global adventurer. Weakness: Hard-to-read subtitles are an eyesore. WTF Moment: Where’s all the social-media support for Expedition Unknown?